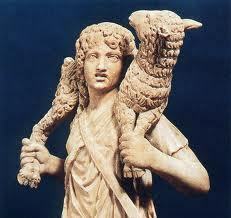 The image for this Sunday is that of the Good Shepherd. It is one of the earliest and most beloved images of Christ, who leads the lost sheep homewards. If you spend some time meditating on the statue of Jesus in the Memorial Garden outside the church, you will see how the gaze of Jesus is one that lovingly wants to lead us back to the House of the Father. We can see too, the holes that the nails made in His body, reminding us that Jesus Christ is Victor as the letters below on the altar proclaim. This Sunday is the World Day of Prayer for Vocations. This is what our Holy Father Pope Francis said recently as part of his message for this Sunday: Dear young friends, never be afraid to go out from yourselves and begin the journey! The Gospel is the message which brings freedom to our lives; it transforms them and makes them all the more beautiful. How wonderful it is to be surprised by God’s call, to embrace his word, and to walk in the footsteps of Jesus, in adoration of the divine mystery and in generous service to our neighbours! Your life will become richer and more joyful each day! If you are wanting to pray for our current students for the Priesthood by name, they are: Gary Dench, Rick Fernandez, Paschal Uche, and with Michael Barwick beginning seminary in the autumn. There is a second collection this weekend for Vocations Promotion within the Diocese, especially vocations to Priesthood and the Religious Life, and is the only source of income for this work. On the website www.brentwoodvocations.org you will find Pope Francis’ Message for today, and video of a conversation with Bishop Alan about his call to priesthood, along with much more information for anyone considering a vocation to priesthood or the religious life. You are also very welcome to contact the Vocations Director, Fr Dominic Howarth, on 01268 281732 or frdominic@brentwoodvocations.org Above all please pray earnestly each day that God will inspire, and young people respond, to the call to follow Jesus in a life of consecrated unconditional service to His Church. God bless you all!